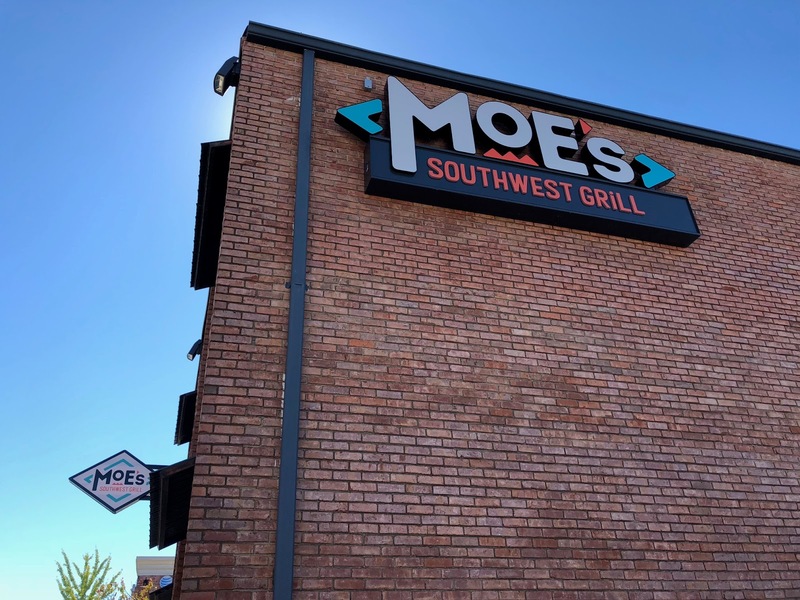 Atlanta-based Moe's Southwest Grill Friday debuted the latest iteration of its restaurant and logo. The "new" restaurant actually opened in place of an existing Moe's that had been closed for the past month or so to undergo the transformation. The restaurant at 6090 Roswell Road in Sandy Springs, is in a freestanding building a few blocks north of I-285 between Hammond Drive and Mount Vernon Highway. The restaurant, which is corporately owned, first opened in 2012. The new Moe's showcases the new logo that ToNeTo Atlanta first reported on this past March. In that post, our weekly Bits & Bits segment, a total of sixteen separate businesses were mentioned and six comments were left. All six comments related to the Moe's logo with most against it and one reader calling it "boring & sterile" adding "elementary school artists could come up with something better." Moe's got its start on Peachtree Road in Buckhead in 2000. Started by prolific restaurateur Martin Sprock, the chain grew to hundreds of locations before being sold to FOCUS Brands, a division of Atlanta-based Roark Capital Group, in 2007. FOCUS also owns franchises Cinnabon, Schlotzsky's, McAlister's Deli, Auntie Anne's, Carvel and as of September, Jamba Juice. FOCUS debuted a new Cinnabon store design and logo at North Point Mall in Alpharetta in late 2015. In late 2016, the company debuted "Schlotzsky's Austin Eatery" an "upmarket" version of their Schlotzsky's concept, at Sugarloaf Marketplace in Duluth. The company debuted a new McAlister's Deli look at Fuqua Development's West Midtown Center at Northside Drive and 17th Street in September. The sad part is, in the case of Schlotzsky's, McAlister's and now Moe's, the company has taken three unique, independent brands, each with their own identity, and turned them into generic "made in a lab" restaurants. It's as if the three brands were all adopted children and their parents allowed them to develop on their own through adolescence and now, as young adults, forced them all to undergo plastic surgery to look like their parents. While its unclear if FOCUS hired the same design firm to create all three logos and menus, all three seem to have the same theme: basic. Moe's has used some version of its original logo since inception, currently with the restaurant's name in red letters on a circular yellow background. Signage on the doors at the Sandy Springs Moe's reads: "THIS IS A TEST LOCATION - Some menu items are new and some are even more awesome than you remember"
The new Moe's is offering a number of items not currently found on other Moe's menus including tortas, and bowls like a deconstructed enchilada, and a quinoa power medley known as "Chef Specialties." 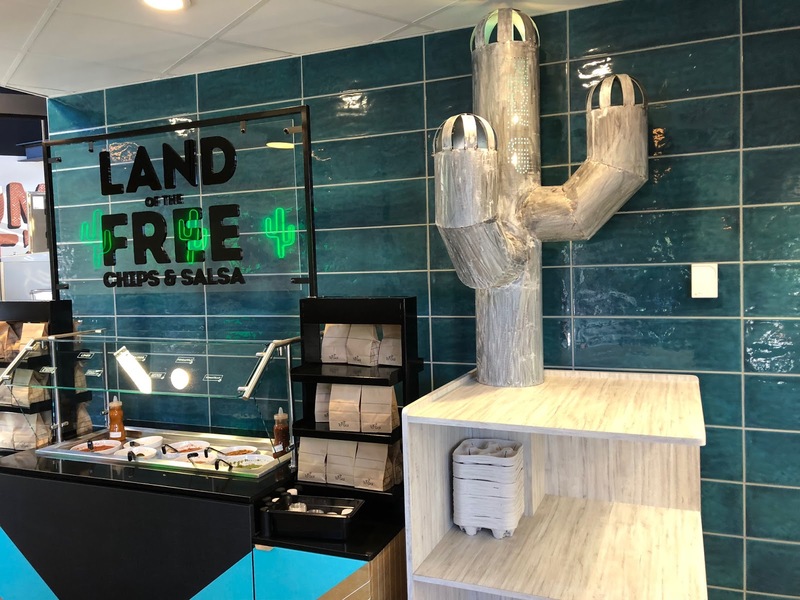 Other offerings include small cinnamon doughnut holes, mac 'n queso and aguas frescas, among other other options. Another departure is that Moe's had used stainless steel pots to store hot proteins and toppings on the line rather than basic, black plastic containers as so many other restaurants do. They have now gone the way of the basic, black plastic containers. The change, while simple, makes a world of difference in appearance as you watch your food be prepared. 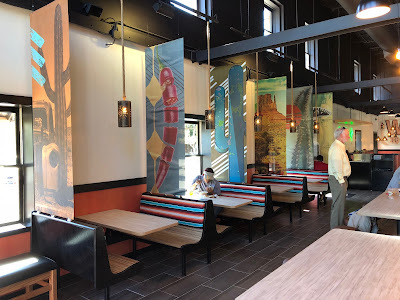 The new restaurant also features updated seating with a canvas, Aztec-like pattern on the restaurant's seat cushions and also features a number of "community" seating, large tables, meant to be shared amongst many diners. Prices of existing menu items at the new Moe's in Sandy Springs were about 30-50 cents higher than the same items at other Atlanta area Moe's locations. 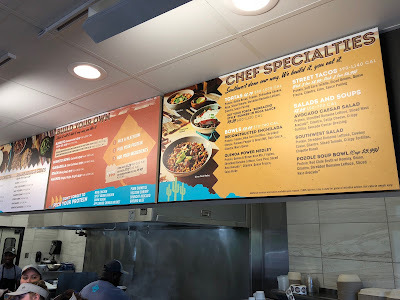 Additionally, the new menu seems to eliminate staggered entree pricing as it relates to various proteins (mojo chicken, carne asada, pork carnitas, yukatan shrimp, ground beef etc.) offering each entree for a flat price. The Homewrecker burrito, for instance, is priced at $8.69. At the Moe's in Phipps Plaza however, the Homewrecker is offered for as much as $8.49 for pork carnitas or steak and as little as $6.79 for "veggie." A new Moe's opening in Kennesaw Marketplace in Kennesaw will also showcase the new look when it opens November 9. The franchisee-owned restaurant, located in an approximately 2,500 square foot space along Ernest Barrett Parkway, will open alongside former Raving Brands sibling brand Flying Biscuit Cafe and Woodstock Mattress Outlet, in a newly built outparcel of the Whole Foods Market anchored center. 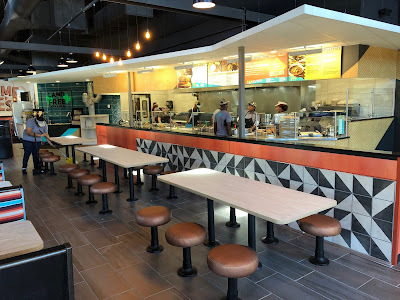 Given that Moe's is still testing the new concept, the Kennesaw outpost may be slightly different than the Sandy Springs location. Another existing Moe's, on Woodstock Road in Roswell, is also expected to receive the brand's new look via a renovation planned for December. The corporately-owned restaurant, which opened in late 2015, was referred to at opening as "Moe's of the Future." 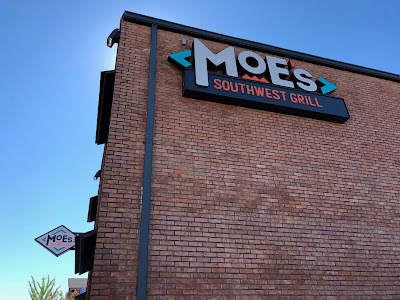 A release announcing its opening said "Moe’s of the Future will execute this testing on an ongoing basis with the ultimate goal of improving guest experience across all Moe’s locations, responding to changes in the industry and tech landscape, increasing efficiency and cost-savings, and attracting new customers to the brand." According to an employee at the restaurant, the 4,000 square foot Moe's is today "not special, we're like any other Moe's." Moe's is the dominant quick serve burrito chain in Georgia with about 75 locations. Fellow national chain operator Chipotle Mexican Grill is in second place with about 50 locations. In third place by store count is Willy's, the Atlanta born chain started by entrepreneur Willy Bitter in 1995 and the concept on which Moe's is based. Willy's operates just 32 locations, but is still the local favorite given their emphasis on freshness and commitment to staying "local." Willy's, too, recently completed a brand overhaul that saw the tweaking of their longstanding menu and renovation of their stores. 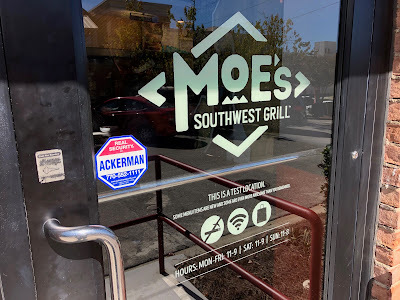 The changes, though, are not nearly as dramatic as the ones taken by Moe's and far better match the brand and its ethos. No doubt Moe's is trying to differentiate themselves in what has become an increasingly competitive market. The chain today has more than 720 locations worldwide. In Atlanta, however, the chain has seen a number of locations close in recent years including those in Atlantic Station and Glenridge Point in Sandy Springs, where in both cases the restaurants were replaced by Salata, a growing salad chain. ToNeTo Atlanta exclusively reported last week that Moe's at Ansley Mall in Midtown will also soon close with plans for Atlanta's third Chopt, another salad chain, to open in its place. The "new" Moe's in Sandy Springs is less than two miles from the corporate offices of FOCUS Brands and corporate staff will no doubt be on location this week observing guests' reception to the new look. Have you been to the new Moe's in Sandy Springs? Do you like the new Moe's look more or less than the classic design?  What is your favorite quick serve Mexican chain in metro Atlanta? Of all my Burrito options in Atlanta, Moe's is last on my list. It's just not as good as any of the others. Tried Chronic tacos twice. Service was terrible both times. Like really really terrible and everything was so salty. 4 days later I was in the hospital and 6 days later DeKalb Board of helth is calling me investigating "an unidentified restaurant" with a shigella bacterial public health outbreak. Douglas Green is right in his comment above; there will alwas be some vocal group that has to make their opinions known about a logo change, but the vast majority of people who don't care or like the change don't usually speak up. As a piece of graphic design, the new logo is objectively better. The old one includes so many bad logo cliche's: glossy 3D effects on the yellow background, superfluous drop shadows, and awful, barely legible typography. 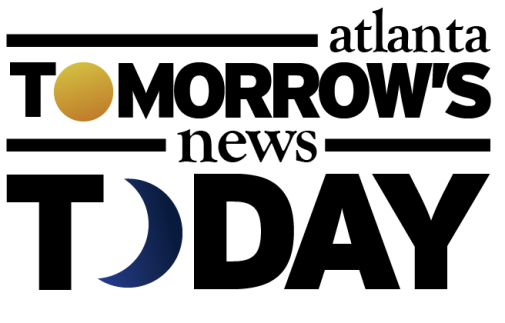 The new logo cleans all of that up, keeps some of the personality, and makes it vastly easier to reproduce in single-color print environments. 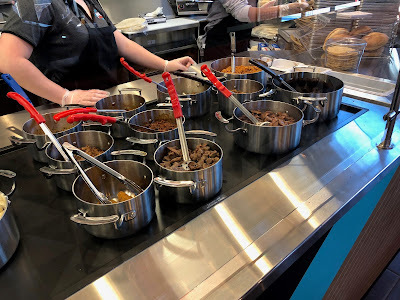 I also see nothing but stainless steel pots holding the proteins and toppings but I'm not sure what that complaint was supposed to be about anyway.